When building with Insulated Concrete Forms (ICFs), foundation forms remain in place and provide insulation on each side of the concrete. The foundation of every building is fundamental in the transfer of all loads throughout a building into the ground. In areas where earthquakes and high winds are a hazard, it must also act to anchor the buildings structure. When determining the best foundation system to use for your home, it is critical to take into consideration the type and bearing capacity of the soil it is to be built on, settling, water and frost. The traditional foundations are constructed by pouring concrete into temporary forms, which are removed when the concrete has cured. When built with Insulated Concrete Forms (ICFs), foundation forms remain in place and provide insulation on each side of the concrete. How much more does it cost more to build foundations with ICFs? Typically, a basement built with ICFs will cost a little more than a comparable concrete or block foundation. Through several studies of ICF construction costs, it has been determined that using ICF wall construction, as a rule, adds about 30 to 40 percent to the total foundation price. However, in the one step that would have produced a bare concrete wall, an ICF wall provides a furred out and insulated wall with a vapor barrier, all the way up to the floor joist. Foundation walls built with ICFs are easier and faster to construct than either concrete masonry unit or cast-in-place concrete foundations. Insulating forms protect the concrete from freezing or rapid drying. After any concrete wall is poured, there is a curing process that needs to occur. Without adequate curing conditions, this does not happen, and the wall weakens and is prone to cracking and even shifting. One of the most common complaints in new homes is leaky basements due to cracked foundation walls. With ICF construction, concrete is protected by the very forms that create its shape, which means that the curing process will complete as required. In fact, because of its optimum curing environment, an ICF wall cures to be stronger than a conventional wall. Rest assured that your ICF wall will not leak, or crack regardless of what season you build in. In extremely hot weather, in which evaporation is a concern, the top of the form need only be covered with plastic sheeting. On the other hand, concrete can be poured in ICFs when the ambient temperature is as low as -15 Celsius, requiring only the top of the form to be protected with insulating blankets. In “firewall” tests ICF walls were subjected to continuous gas flames and temperatures of up to 2,000°F for as long as four hours. None of the ICF walls ever failed structurally, in contrast to wood-frame walls, which typically collapse in one hour or less. In one step, the lower level is poured, framed, and insulated all the way up to the floor joists, even throughout daylight and walk out areas; eliminating the need for any work before the subfloor can be installed. What is the average R-value of ICF walls? Walls made of Insulated Concrete Forms are rated on average, like a wood-frame wall constructed with R-25 insulation. But that’s not the whole story. The equivalent R-value performance of ICFs consists of three factors. First is the R-value of the expanded polystyrene. Second, the thermal stability of massive concrete walls reduces the temperature fluctuations and, consequently, the heat load requirements that are common to wood-frame buildings. Finally, air leakage (infiltration) can account for 20 to 40 percent of the heat load requirements of a wood-frame building. ICFs eliminate this air infiltration through the wall assembly. As a result, with the combined performance of the R-value of the expanded polystyrene, the stabilizing effects of the thermal mass of the concrete, and the reduced air infiltration, ICF walls actually perform as high as R-40 to R-50 — or more in some areas of the country. Won’t the foam burn or give off harmful emissions? The foams in ICFs are manufactured with flame-retardant additives. The National Research Council reviewed the numerous existing studies of fire emissions and concluded that the emissions from polystyrene foams are no more toxic than those of typical softwoods used in home construction. Can radius and angled walls be constructed with ICFs? Pre-formed 90 and 45-degree corners are available to speed construction since they are the most commonly used corner angles. Radius walls are easily constructed by miter-cutting the form at the proper angle and using foam to join the edges. Some manufacturers will deliver already curved walls. One thing to keep in mind is that you have to finish the basement with drywall due to the building code regulations. you can not have an “unfinished” basement due to the styrofoam fumes if it ever catches fire. An ICF basement should be called a “lower level” since the old stereotypes about basement do not apply to them. 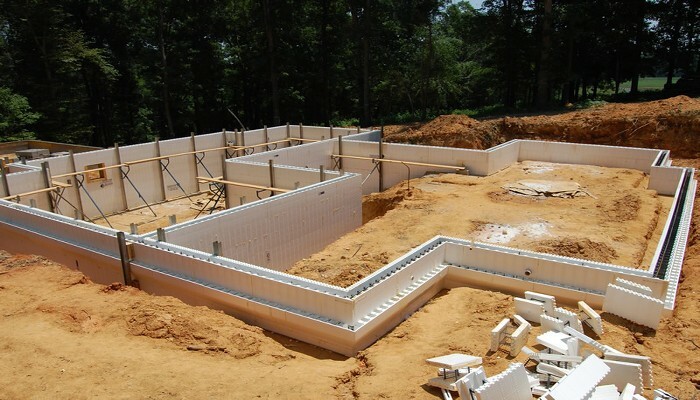 An ICF foundation is warm, dry, quiet, comfortable, and provides no opportunity for mold growth; since there is no cavity where warm, moist air meets a cold wall and condenses. Download: Economic Assessment of Basement Systems It is part of Performance Guidelines for Basement Envelope Systems and Materials, a joint project of Canada Mortgage and Housing Corporation (CMHC) and the National Research Council’s (NRC) Institute for Research in Construction (IRC). Download “COSTS AND BENEFITS OF INSULATING CONCRETE FORMS FOR RESIDENTIAL CONSTRUCTION” a study done by U.S. Department of Housing and Urban Development Office of Policy Development and Research by clicking here! Insulated Concrete Forms – FAQ ICF R-Value – We Call This The ICF Effect ICF Saves 60% On Your Energy Bills – Canadian Study Proves It How Much Will a Home Built With Insulated Concrete Forms Cost? Very informative! To start a project in the construction of buildings and houses, it is very important to consider the type and bearing capacity of the soil to where it is built including the frost, settling of soil and water. It was perfect for me what I started my project with the experts. Excellent article on ICF pros/con of using ICF block. It’s pretty much a no brainer to use ICF block even with the initial material cost. The benefits outway the extra cost. Only ICFs with metal webs.